A 33 year old woman had a 2.4 cm. 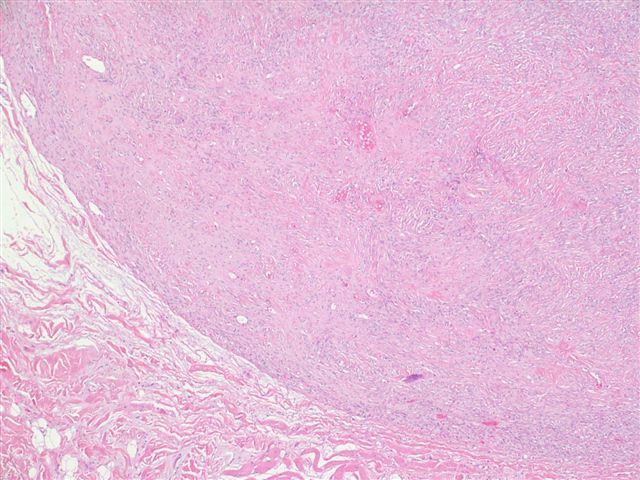 soft tissue mass of the cheek. Her past medical history was remarkable only for a remote mitral valve replacement.� The mass had been present for a while, but recently grew in size prompting a visit to her doctor. 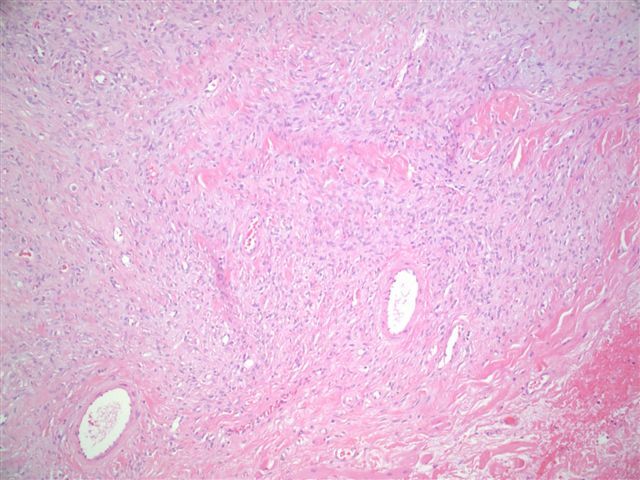 Gross description:� The specimen contained a 2.4 cm, subcutaneous, rubbery, pink-tan mass with an elliptical strip of pale overlying skin. 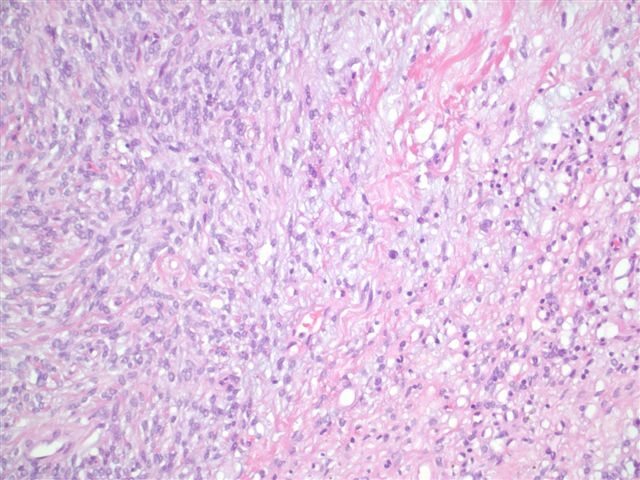 Solitary fibrous tumor was originally reported in the pleura, but has since been reported at almost all organ and body sites.� In the skin, they are well circumscribed dermal lesions, composed of spindle cells in a patternless pattern of short and narrow fascicles.� There are intermixed bundles of thick collagen, and numerous blood vessels which may have a hemangiopericytoma-like, staghorn pattern.� Variable features include hypocellular and hypercellular areas and myxoid areas.� Tumor cells are immunoreactive for CD34, vimentin and bcl2, and negative for Factor XIIIa, CD68, neural, smooth muscle and epithelial markers.� Excision is curative, as these tumors almost always have benign behavior. 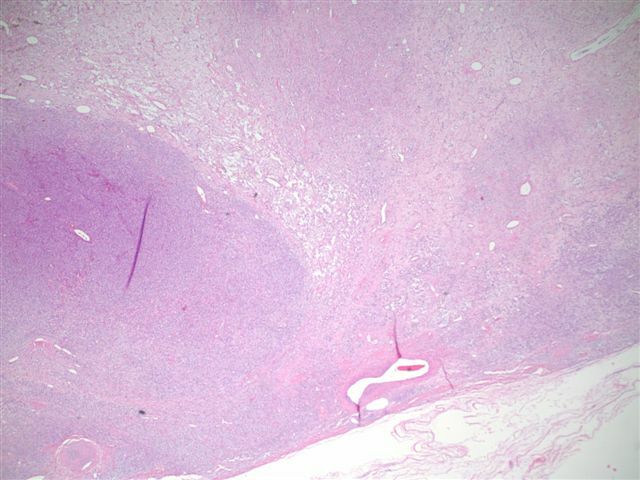 The differential diagnosis includes other spindled tumors of the skin.� One uncommon mimic is a CD34-reactive dermal dendrocytoma, which is also a benign, well circumscribed tumor composed of CD34+ spindle cells and collagen fibers, with a loose fascicular pattern.� However, the collagen fibers are thin, not thick, and the background is invariably myxoid.� In addition, its tumor cells are CD68+, in contrast to CD68- tumor cells in solitary fibrous tumor (Am J Dermatopathol 2002;24:50).